This quarter I’m TAing for a class called Distributed Cognition, which explores a bunch of ways that cognition might not be something that happens exclusively in the brain. This week we looked at different flavors of embodiment, the idea that the body is crucial for cognition. For example, we talked about one study showing that people who were unknowingly leaning to the left made numerical estimates that were too small (consistent with the location of smaller numbers on our number line), while those leaning to the right made overestimations (Eerland, Guadalupe, & Zwaan, 2011). The overarching theme was that the state of our body can affect thoughts that we typically attribute only to our brain. It’s also an example of what many researchers refer to as “ego depletion,” the idea that we have a limited pool of mental resources, and cognition suffers once they’re used up. We get mentally fatigued, and then make poor decisions or have poor performance on some task as a result. Ego depletion underlies claims that working fewer hours increases productivity. I read this sort of advice often, each time thinking to myself, yes! I should do that. I feel this way especially on days like today, a Saturday morning in which ego depletion is fresh on my mind. I’m in recovery mode. Then, inspired to change my work habits, I’ll open my calendar to decide which work hours I’ll shave off the week, and I just stare at it. My trusty, color-coded calendar feels non-negotiable, so I close it and decide that working fewer hours maybe isn’t that crucial. I convince myself of this by reading reminders that some researchers claim that ego depletion is all in our heads. There’s probably some truth to this too – I often don’t start to feel drained until I acknowledge how busy I’ve been. I do a lot of meta-cognition about work. By that I mean that I think about my work patterns and other people’s, and I try to evaluate what’s good bad about those patterns. My conclusion, for this morning at least, is that there’s probably not a one-size-fits-all solution to this issue. 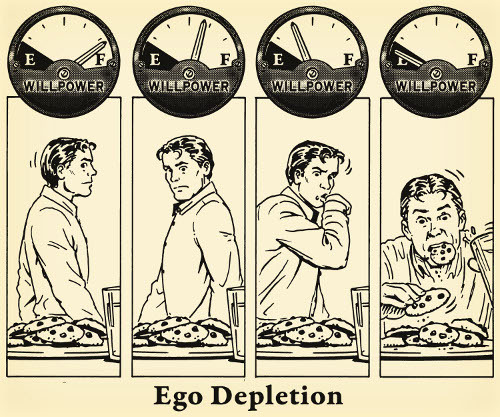 Some people might suffer from major ego depletion, while others might be more Energizer-bunny-like. Some weeks a person might get tons done while putting in many hours, and other weeks might be more efficient with a leaner schedule. For me, my goal is to work deliberately and mindfully, taking each week, day, or project as it comes, and adapting work habits as necessary. I will probably never discover the secret recipe for 100% efficient work, but that’s ok – it’s kind of fun trying to figure it out anyway.